This was just the beginning of a campaign of hate and fear that would reach every sector of Amarillo society, turning neighbor against neighbor and almost causing a mini-civil war. The Birchers used this same operating method in towns across the country. First, local religious leaders were attacked for belonging to the National Council of Churches and then the Council was accused of being a pawn of the Communist Party. Finally the whole ugly mess would spill over into other local institutions such as schools, local governments and politics. Officially, Welch tried to keep his organization free from charges of anti-Semitism but he really didn’t put a whole lot of effort into it so his success was negligible at best. 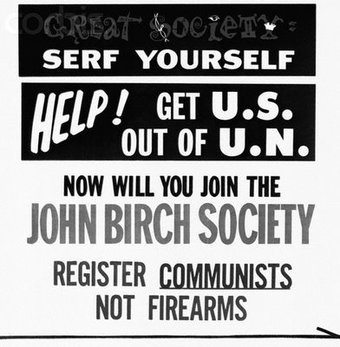 Robert Welch and other leaders of the John Birch Society adamantly denied that their organization was politically motivated. 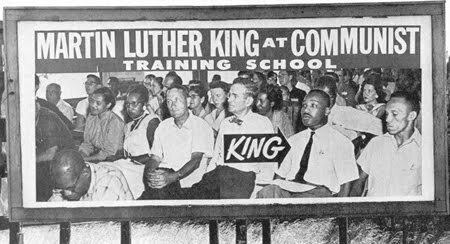 But in 1964, they claimed they had at least a hundred delegates and alternates at the Republican National Convention in San Francisco. 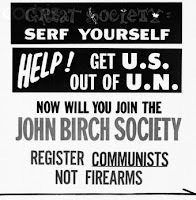 How can the John Birch Society be an effective political instrument while it is led by a man whose views on current affairs are, at so many critical points . . . so far removed from common sense? Mr. Welch is only one man, and I do not believe his views, far removed from reality and common sense as they are, represent the feelings of most members of the John Birch Society. . . . Because of this, I believe the best thing Mr. Welch could do to serve the cause of anti-Communism in the United States would be to resign. . . . We cannot allow the emblem of irresponsibility to attach to the conservative banner. These attacks may have diminished the impact of the Society but the JBS was not ready to roll over and die just yet. The Society’s most successful campaigns really were not on the national level but on the soft underbelly of American where a minimum amount of pressure could often produce a maximum level of alarm. Some of this was described in Part 1 in the sections on churches and schools. But one of the most intriguing operations involved organizing boycotts through the use of cards, variously called Card Capers or Card Parties. In 1962, a Miami chiropractor by the name of Jerome Harold organized The Committee to Warn of the Arrival of Communist Merchandise on the Local Business Scene. When Welch heard about it, he urged his members to get in touch with Harold. Members took the cards and unobtrusively entered the marked stores – dropping them on counters and tucking them under merchandise. If a Bircher was caught red-handed, he would apologize, say it was all an accident and quietly leave the. But they always had another card with them – with the name of a lawyer just in case. Society members urged local and state representatives and agencies to pass laws imposing prohibitive taxes on stores carrying merchandise from Eastern Europe. Some of the biggest names in America’s retail industry yielded under the pressure and Sears, Woolworth, Kresge, the Walgreen Company, and others, stopped carrying “red” goods. The American Opinion Library in Houston, identical to other Birch libraries across the country, served as an index to many of the Society’s activities at that time. One was able to purchase pamphlets which defended the JBS from its critics and analyzed the cause of the Los Angeles riots and the Civil Rights movement. In one pamphlet was a picture of Martin Luther King at the Highlander Folk School, now The Highlander Research and Education Center) which was located in Monteagle, Tennessee at the time. Billboards with this picture were scattered along America’s highways from East to West. Also found in the library were bumper stickers urging the United States to withdraw from the United Nations and declaring that “Disarmament is Surrender.” The inevitable pieces of jewelry were sold which had similar messages inscribed on them. And copies of Welch’s speeches were also available. I didn’t write about the fluoridation issue in the original paper, but I can remember my family questioning Welch’s mental faculties every time there was a news report about his dire warnings that it was a Communist plot to poison the minds of Americans. Besides Rachel Maddow’s now famous video, there is this very good report here which quotes from the March 1960 JBS Bulletin. 6. Janson, The Far Right, p. 41. 7. Forster and Epstein, Danger on the Right, p. 3-4. 9. Forster and Epstein, The John Birch Society, p. 33. 11. Forster and Epstein, Danger on the Right, p. 24. 13. Constructive Action Committee, Civil Riots U.S.A. (1965). The Buckley and Goldwater quotes illustrate what is most obviously lacking on the right these days. A few people like David Frum have been sounding the alarm about the extremists and crazies, but not in such blunt terms, and there aren't figures as major as Buckley and Goldwater taking on the problem. Still, the process may have a ways to run yet. From these posts it seems that the JBS simply kept on and on escalating its behavior until it came to be perceived as intolerable by enough people that it provoked a real backlash. The crazies of today certainly look like they're headed down the same path. Great write up Leslie.. I agree with Infidel we are missing the common sense voices from the right. David Frum, Andrew Sullivan and even Buckley, JR, have tried to speak out but then they are vilified and run out of the party so to speak. The right has gone so far right that the sane people are ignored and the crazies are embraced. Hopefully, the teabaggers, which seem to be just a branch of the JBS will run it's course soon. But even if that happens, until the right decides to move back to the middle, instead of living on the fringe there can be no hope for them. The modern Rushpubliscum Party is a Stalinist organization that purges anyone who deviates even a millimeter from the party line. They no longer have alternative ideas in their leadership, because the Robertson cadres have dealt with any who might pose a challenge to their orthodoxy. Infidel: You're exactly right. And this is one of the things I'm going to touch on in the next and final part. I think the JBS lost their momentum around 1964 or 1965 for exactly the reasons you state. Also, I think the memories of McCarthyism were still fresh in the public mind. HUAC was still around but I'm sure that most people were alarmed at that gang of thugs as well. HUAC's decline began around 1960 but they managed to hang on for another 15 years. I think all of us, me included - people who either lived through WWII or who are familiar with their history - get nervous when these kinds of off-the-wall fringe elements muscle their way into the lives of descent and half-way intelligent Americans. While there are a lot of parallels to this in kind of loony behavior and Nazi Germany, I think we have to remember that in this country, at least, these extremist groups simply don't last. I attribute that to our form of government, hiccups though it's had along the way, and to the strong character of the people. My main area of concern is FOX news. I'd love to see a class action suit filed against them. If they're not downright seditious, they are absolutely irresponsible and too stupid to recognize the monster they have created. It's all a sinister game for them. Annette: Thanks - I always value your comments. I agree with you about everything except the TP being a branch of the JBS. As I said in Part I, there are certainly enough similarities but there are also some real differences. I will go into this in Part 3. JR: I agree with you but I think there may just be a tiny crack beginning in their armour as the public is becoming more and more repulsed by the lies, the chicanery, the obstructionism in Congress, the virtual censorship, etc. I think in the long run, the GOP has just about hung itself. Let's hope so. Interesting article you've put together. I enjoyed reading it. Thanks, Lizzy. I feel very fortunate in having outstanding commenters. They are very knowledgeable and thoughtful. Best of all I always learn from them. Thanks for stopping by. This was excellent, Leslie. I knew of them of course but the depth of research really helped fill in the blanks. If we can stay alive long enough we're gonna be pretty smart some day. Some of the denial of truth by the Birchers reminds me of the Birther idiots. This was a great post that hit me really hard. For years as I was growing the Birchers even here in the South were viewed as nutcases. I had not thought of them at all until very recently when I had to enter my boss's office to retrieve some papers. Now my boss is a cardcaring Teabagger and for the obvious reasons I have to give him a wide berth but I never really thought he had swallowed all the batshit crazy Kool-Aid. Until that night when along with his collection of Glen Beck books was a book by some Bircher published in the 60's saying that Joe McCarthy had been killed by commies in the government and that even then were working to bring down the republic. I give the guy and even wider berth now. J.R. nails, it: in its approach, the GOP has become the functional equivalent of the Birchers. It's not a big-tent party, just a narrow political pressure group. Re: the fluoridation madness. In my area there are people who to this day insist putting fluoride in the water supply is unconstitutional and part of some kind of devious conspiracy to harm innocent people. They periodically launch letter-writing campaigns to the newspaper. Then, there's the menace known as contrails from jet aircraft. No kidding. tnlib wrote: "My main area of concern is FOX news. I'd love to see a class action suit filed against them. If they're not downright seditious, they are absolutely irresponsible and too stupid to recognize the monster they have created." Unfortunately, that would be really damaging to the First Amendment. What ought to happen is that the network be made to register as what it is: an organ of the Republican Party. It would also help if everyone who's not right-wing resenter would boycott Fox sponsors. That's the kind of message even Rupert Murdoch might not be able to ignore indefinitely. Oso: Thanks. This is based pretty solidly on a paper I wrote in 1964 in college which was 5000 words. I had to delete what I didn't consider pertinent to my main thesis for the blog. Plus, my writing style has changed - not necessarily for the better either. BB: Wow, I'd have a very difficult time working for someone like that. Wonder what he'd say if you put up books by Gore and Clinton. Don't recommend trying it though. SW: I found a quote from Welch that fluoridation would medicate the people! The contrails thing I've heard about but I don't think the theory has ever really taken off. Maybe they should let Victoria Jackson take off on that. Sounds right up her alley. You're absolutely right about the First Amendment. Registering as an organ of the Republican Party sounds much more feasible. I think we should be promoting that on our blogs. That and boycotting Fox sponsors. I see lists from time to time, but I'm not familiar with what most of these companies make. It's worth pursuing, though. Thanks everyone. It's always a treat to wake up in the morning to such wonderful comments.